At IWM Duxford, under the watchful eye of a Douglas Dakota, Royal Enfield unveiled the Classic 500 Pegasus - a limited edition version of the Classic 500 styled on the WWII-era RE/WD 125cc Flying Flea. For those of us who are not history buffs, the Flying Flea was a lightweight 125cc motorcycle that Enfield produced from the 1930s, right through to the ‘60s, but its heyday was arguably in the 1940s. 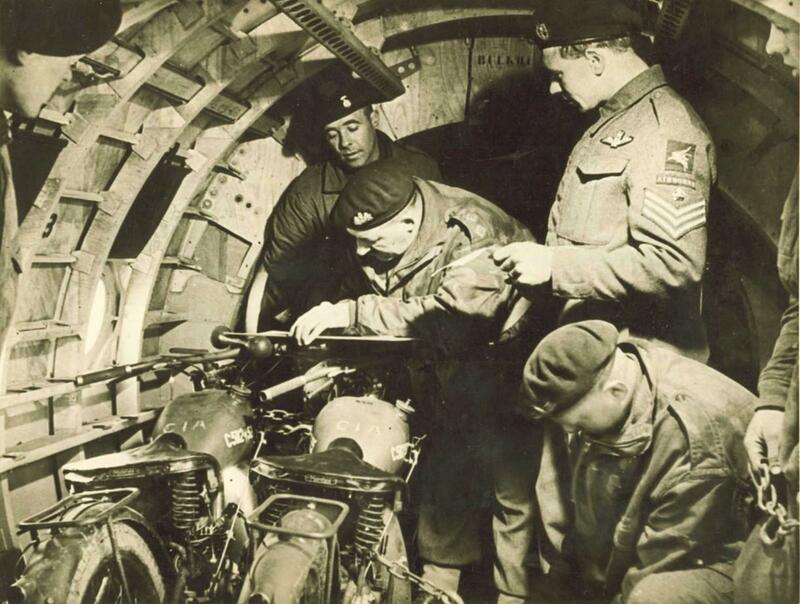 The Army had come up with this mad idea of throwing people out of planes towards the enemy and realised that when they were down there, the soldiers needed to get around. At first they tried bicycles but that didn’t go particularly well, so they had they idea of dropping lightweight motorcycles from planes instead – enter the Flying Flea. So light a solider could lift it above his head and capable of speeds in excess of 40mph, the Flea was a runaway success. It saw action all over the world but the Flea is best remembered for its use on D-Day and later in Operation Market Garden. It’s this bike and the brave men who used it, that Enfield have honoured with the special edition Pegasus. Royal Enfield have unveiled the Classic 500 Pegasus Edition - a homage to the original WWII Flying Flea, seen here with the men who took them into battle. Based on the Classic 500, the Pegasus edition has a maroon and blue Pegasus emblem, the official Parachute Regiment insignia, and a unique serial number stencilled on the tank. The painted markings are based on a genuine WWII model, including the yellow stripe on the crankcase that signifies the centre of mass for loading onto a plane. 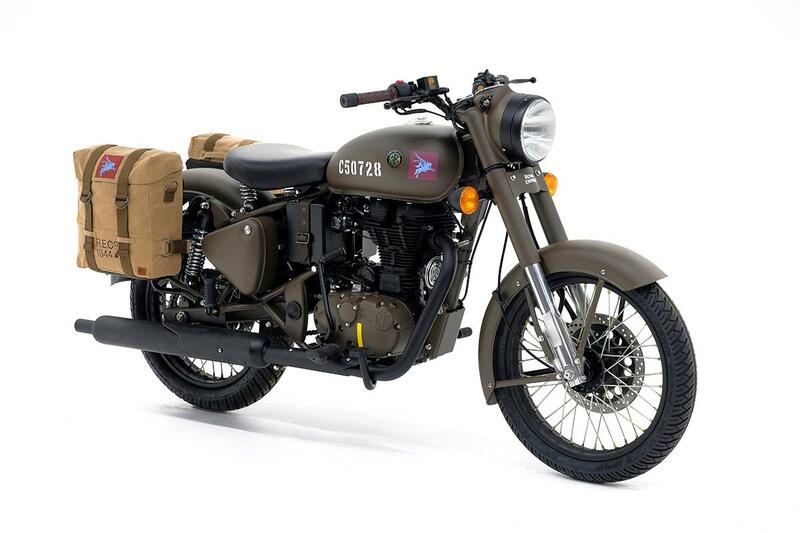 The new bikes are painted in the wartime colours of Service Brown and Olive Drab Green, and include period-correct brown handlebar grips, leather strap with brass buckles across the air filter, blacked out silencers, rims, kickstart, pedals and headlight bezel. Each of bikes also comes with a pair of military-style canvas panniers emblazoned with the Pegasus logo, plus there’s a range of themed accessories. As you might imagine, it rides no differently to a regular Classic 500, so the pace is leisurely, the brakes soft and the suspension even softer but there’s no doubting that it’s fun to ride. Dashing down the lanes behind Duxford alongside two pals in leather jackets, with the gentle drone of a Dakota in the background, you could almost imagine you were off to give the Jerries a good thrashing. Motorcycling doesn’t always have to be about lap times or fast corners. It can just as equally be about a leisure meander to the next village and it’s this that an Enfield does so well. And why wouldn’t you? Enfield are only making 1000 of the Pegasus and of those 190 will be coming to the UK. They will be priced at £4999 (OTR) and orders will be taken online from July, although we don’t think they’ll be around for long.